^ "ASKS TRUNK SERVICE ON SUBWAY SHUTTLE; C.A. 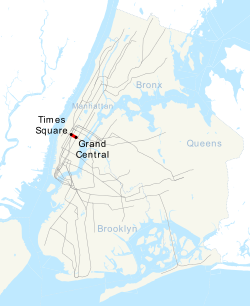 Smith Proposes Through Trains Over Line Between Times Sq. and Grand Central. NEW STATIONS NECESSARY F. L. Stuart Suggests Deep-Level Tunnels to Solve Commuter Problem in City. Predicts Big Traffic Increase. Proposes Community Plan". The New York Times. April 17, 1930. ISSN 0362-4331. Retrieved June 6, 2018. ^ a b "MEMORANDUM OF AGREEMENT BETWEEN FEDERAL TRANSIT ADMINISTRATION NEW YORK STATE HISTORIC PRESERVATION OFFICE NEW YORK CITY TRANSIT AUTHORITY REGARDING THE TIMES SQUARE SHUTTLE STATION DURING CONTRACT A- 35302, THE RECONFIGURATION OF THE TIMES SQUARE SHUTTLE STATION, SHPO PROJECT #17PR00545" (PDF). mta.info. Metropolitan Transportation Authority. April 25, 2018. Archived from the original (PDF) on April 25, 2018. Retrieved April 27, 2018. ^ "AMENDMENT TO THE MEMORANDUM OF AGREEMENT BETWEEN FEDERAL TRANSIT ADMINISTRATION NEW YORK STATE HISTORIC PRESERVATION OFFICE NEW YORK CITY TRANSIT AUTHORITY REGARDING THE TIMES SQUARE SHUTTLE STATION DURING CONTRACT A- 35302, THE RECONFIGURATION OF THE TIMES SQUARE SHUTTLE STATION, SHPO PROJECT #17PR00545" (PDF). mta.info. Metropolitan Transportation Authority. April 25, 2018. Archived from the original (PDF) on April 25, 2018. Retrieved April 27, 2018. ^ "MTA - Eye on the Future". web.mta.info. Metropolitan Transportation Authority. Archived from the original on July 27, 2013. Retrieved March 15, 2018.